The rapper released his two songs under one title, Scary Hours on Friday (19Jan18), with promotional art featuring gothic text superimposed on bold text in a less elaborate font, with the letters descending vertically in front of a black background. On Instagram, electronica musician Rabit pointed out similarities between the single cover and a poster an artist named Collin Fletcher designed for his 2015 Communion tour. "Today I wake up to see OVO (Sound, Drake's own label) has redone one of my 2015 tour posters designed by @collindfletcher for Drake's new single," he wrote. "Poor Collin is always having his style stolen." In a statement to Pitchfork Media, Collin backed up the musician's claim, saying, "This is a story that too many artists, musicians, and designers identify with. Hopefully this results in a larger conversation about popular culture's relationship to underground artists." Drake's representatives did not respond to a request for comment. On Twitter, a representative of Rabit's label Tri Angle Records wrote that they would not be getting "bogged down in negativity" over the similarity between the two designs, but hoped the controversy would "shine a light" on Collin's design skills. 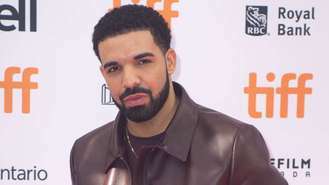 Canadian hip-hop star Drake, 31, is the latest musician to be accused of lifting the work of lesser known artists to use as promotional artwork. Last week (end21Jan18), London-based designer Dom Sebastian criticised Katy Perry for allegedly using his work without permission. Sebastian alleged that a piece from his 2012 'Holographic Melt' series appeared as the cover for Hot Chip's remix of her track Chained to the Rhythm.